Emerging market leaders have become big fans of social media. What do they have to say about themselves? If you go on Twitter and search for Barack Obama, you’ll find that the account bearing the US president’s name is run by the staff of Organizing for Action, a pro-democrat advocacy group. So Barack seldom writes there. The next one down, @POTUS, is supposed to be Mr Obama’s official handle. But the formulaic tone of the 130 tweets featured there also makes you wonder who actually writes them. If you go on Instagram and search for BRIC leaders, by contrast, you’ll quickly be reassured that each profile is genuinely managed by its purported owner. Or at least that’s true of Dmitry Medvedev, Russia’s prime minister, who shares with us some of his most personal moments with pride and innocence. So what do emerging market big wigs like to show about themselves? You can judge by yourself by visiting their pages via the links below, but in what I intend to make a little series I’ll try and provide you with an idea of what you’re likely to find – and of what it tells us about each leader’s governing style. Today we’ll take a look at the first two. And since we’re there we’ll start with Dmitry, who goes by the Instagram user name of damedvedev. The first interesting thing here is that I came across his pics via The Moscow Times, which also mentioned that Mr Mdevedev’s Twitter account is @damedvedev – presumably because this is where they pinched the photos in the first place. Well guess what – since the newspaper published this entertaining post, the account has been suspended. But taking a look at the small selection curated by The Moscow Times, what do learn about Russia’s Prime Minister? We learn that Mr Medvedev tries do much the same as his mercurial boss, Vladimir Putin, except with perhaps less success. He’s holding guns and being cuddly with kids, skiing in Sochi with Vlad and being awkward in a classroom. And he’s exploring space, along with fellow Russian star Yuri Gararin, in his everyday suit. What that says about the governing style of Russian leaders won’t be a big surprise to many: much of what filters through the Kremlin’s walls to reach people’s screens is staged, but often it's hard to believe anyway. Turning to Dilma Rousseff, whom you’ll find on Instagram as dilmarousseff, the general message you get is quite different. 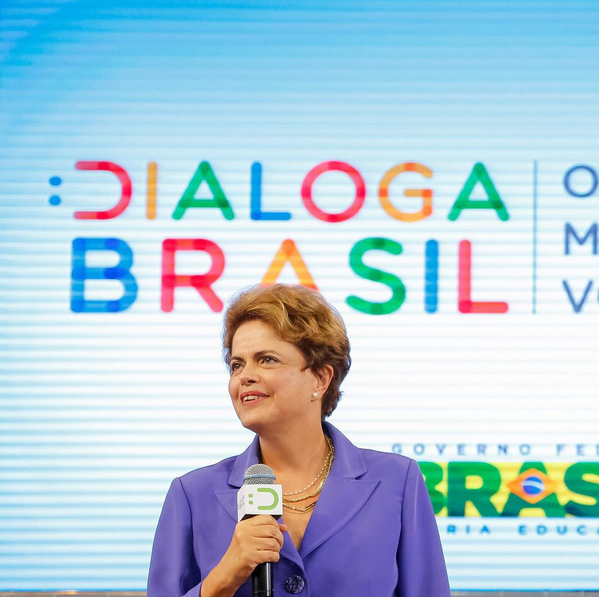 For one, Brazil’s president is very rarely alone. And when she is, it’s because she’s on a stage holding a microphone, looking determined and inspirational. Otherwise she’s among her people: on a train with workers, holding kids in her arms, among sportsmen. She’s also shaking hands with the movers and shakers of this world, from Vladimir Putin and Joe Biden to David Cameron and Chinese leaders. And she travels in a wide variety of four wheels, from a black classic car during a military parade to a Google-branded self-driving vehicle on a sunny day. She’s never in front. The take-away from all this is that Dilma doesn’t want to be seen as lounging in the back seat. She also wants to be seen as a strong, yet human female leader, much in charge yet caring about her people. But that balance is hard to find, and, in the case of Ms Rousseff, not completely attained. You can’t help but notice that on her pics she’s always rather static (not surprising for a photo, but you see what I mean). She also tends to stay quite far when greeting people, even when it’s a dog. She doesn’t laugh – and even when she smiles, she often looks serious. This general feeling may help explain why, despite efforts to appear warmer and closer to her citizen’s concerns, she’s not really managed to shake off her image as a technocratic, somewhat distant leader. And at a time when Brazil faces corruption scandals and economic headwinds, that’s not doing her popularity any favour. Next time we’ll take a look at India’s Narendra Modi (27 pics, but 665,000 followers) and China’s Xi Jinping (169 posts, but 22,500 followers). Stay online.